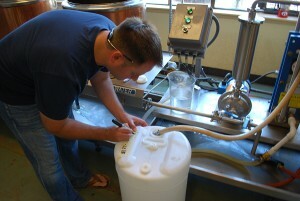 I always thought it would be fun to brew my own beer, but I never knew where to start. What ingredients do I need? Do I have the right equipment? It just seemed like a really complicated process. 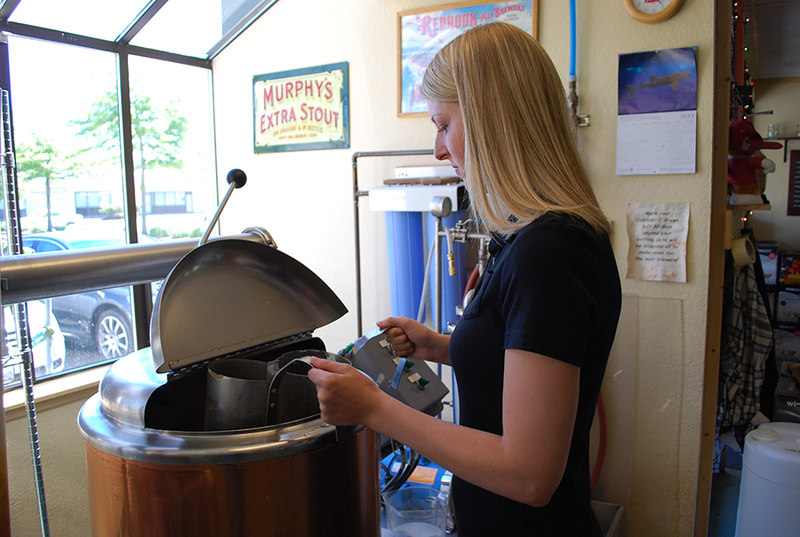 Well, there’s good news for anyone like me who wants to be a brewmaster but doesn’t know where to begin: Gallaghers’ Where U Brew in Edmonds has tons of recipes, the proper equipment, and a simplified, step-by-step process to make your own beer. While Gallaghers’ Where U Brew (180 W Dayton St #105) makes brewing easy, there’s a really tough decision to make the second you walk in the door. 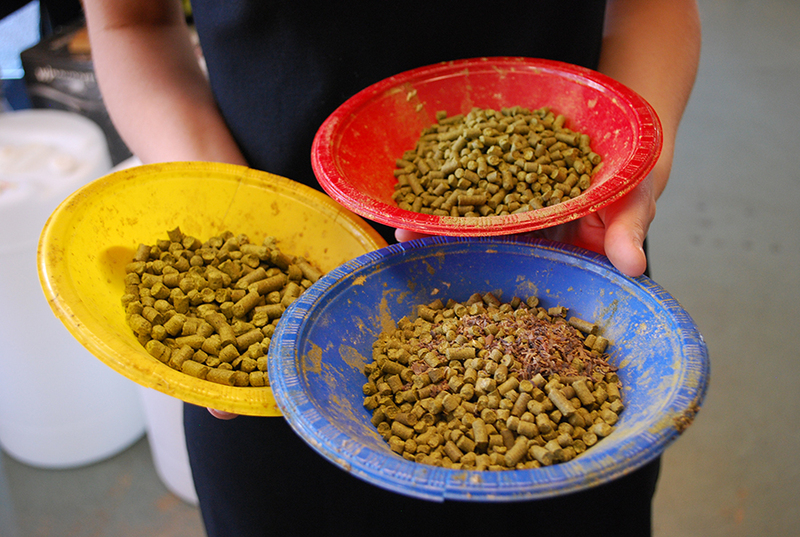 What type of beer do you want to brew? Gallaghers’ has more than 50 recipes, and they add more all the time. You can choose a blonde, a stout, an IPA — anything. 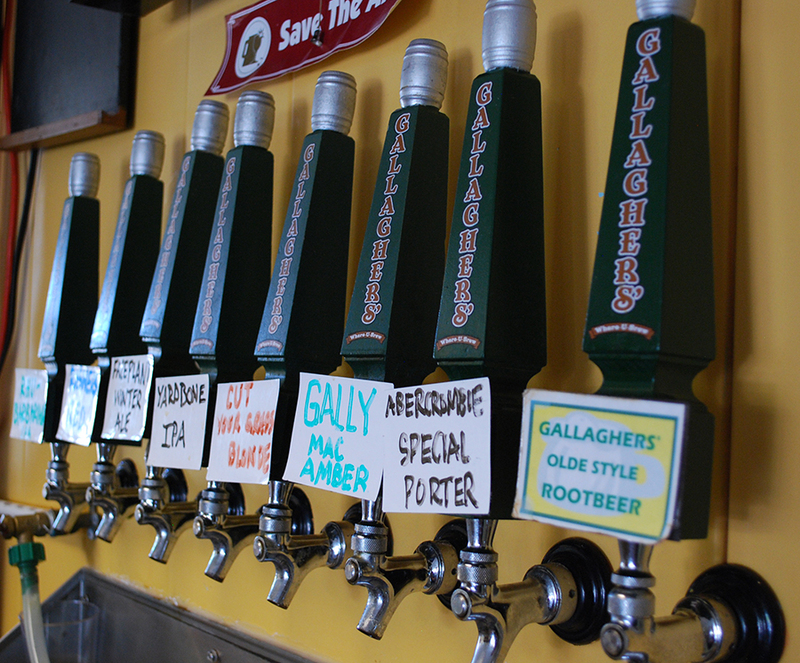 To help make the decision easier for you, there are eight active taps at Gallaghers’ so you can try a few samples before you brew. Tove and I quickly jumped at one of the new recipes at Gallaghers’ Where U Brew: Yardbone IPA. Modeled after the RPM IPA by Boneyard Brewery in Bend, Oregon, the Yardbone IPA is a full-flavored, citrusy beer, which we thought would be good for the warm summer months. It’s so new to Gallaghers’ that the recipe is literally scratched on a piece of paper. Not knowing what we were doing anyway, that was more than enough for us to knock out a killer batch of brew (or at least we hope). Gallaghers’ Where U Brew leaves everything up to you. The helpful and friendly employees give you a few directions to start, but then it’s a hands-off approach. You have to measure the grains and put them through a grinder, pour the syrupy lager (and in some cases amber), weigh and mix the hops, heat and stir your vat — you’re literally in charge of the entire brewing process from beginning to end. Again, each step is clearly written out on an easy-to-follow instruction sheet, so there’s nothing to be afraid of. If you ever have a question, the staff is quickly by your side to help. As you can imagine, the brewing process isn’t fast. It took us a little more than two hours to complete our full batch of Yardbone IPA (which fills about 132 12-ounce bottles). With that said, there’s plenty of “sit and wait” at Gallaghers’ Where U Brew (to allow your liquid to boil, etc. ), but that’s almost the best part of the experience. We met some fantastic people while we were there, because it’s almost like a little community. Just like any bar, people are at Gallaghers’ to have a good time. That means the waiting game is filled with fun conversation and a few beers (or root beer) off the flowing taps. There are some folks who simply show up at Gallaghers’ Where U Brew to just hang out and guzzle a few pints. They even have a mug club that anyone can join for $40. In other words, Gallaghers’ operates like a normal bar. That means you don’t have to be brewing to enjoy the beers on tap. I should also mention that outside food is welcome at Gallaghers’. You can bring your own meal or even have grub delivered to Gallaghers’ Where U Brew. That way you can have good eats while you’re making/drinking your beer. 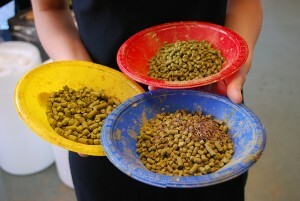 A trip to Gallaghers’ Where U Brew is actually a two-step process. 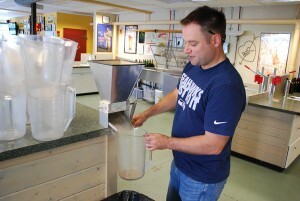 Once you finish brewing your beer, the employees pump your mixture into a large plastic container. Your brew then has to ferment for two weeks before you can come back and bottle it. You can bring your own bottles or buy bottles from Gallaghers’. Our friend Marty and his wife Karen, veterans at Gallaghers’ Where U Brew (who we met on our visit), recommend using brown bottles if you bring your own. They told us to not even think about using Corona bottles or green (Rolling Rock, Heineken, etc.) bottles. I’m not really sure why that is, but we’ll take their word for it. They’ve brewed beer at Gallaghers’ much more than we have. If you don’t like beer, you can still have fun at Gallaghers’ Where U Brew. On top of their beer recipes, you can also make ciders and/or wine (they have several kits to choose from). Just keep in mind, the fermenting period for wine is much longer than beer. You have to let it sit for six weeks, but once it’s done you’ll have 28 bottles of wine to your name. Tove and I talked about how much fun we had at Gallaghers’ Where U Brew on our entire drive back to Seattle. I wasn’t really sure what to expect when we were invited there, but now I can’t wait to go back again. 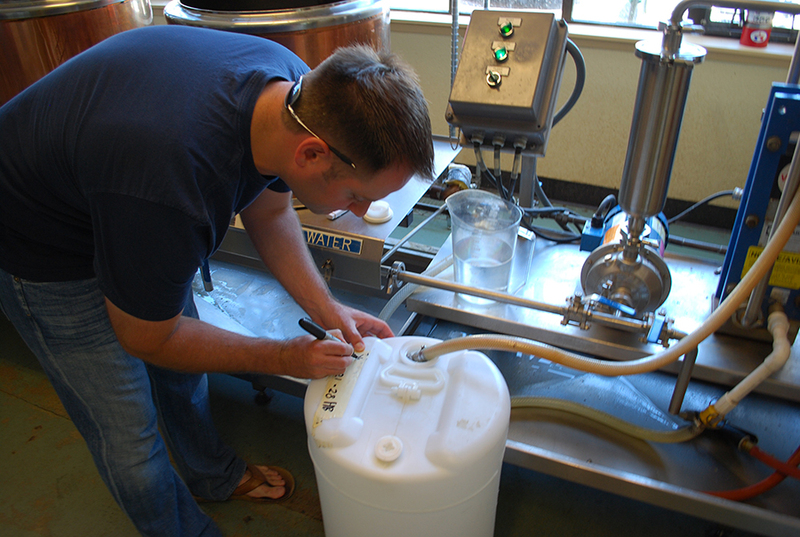 The best part is that we’ll return in a couple weeks (or so) to finally taste and bottle our brew. We get to take half of our batch home with us, while the other half goes on tap for other patrons to enjoy (hopefully we didn’t mess up!). We tweeted quite a bit when we were at Gallaghers’ Where U Brew and the response was the same from everyone, “Wow! That looks like fun,” and/or “I didn’t know that place existed.” Well, it is and it does, and we highly recommend a trip to Edmonds to try Gallaghers’ yourself (be sure to mention the Seattle Bloggers sent you). It’s a really fun experience filled with great people and good beer. How can you beat that? We want to take you through the entire process at Gallaghers’ Where U Brew, so stay tuned for our update on the bottling/tasting process! We should have that for you in a few weeks! 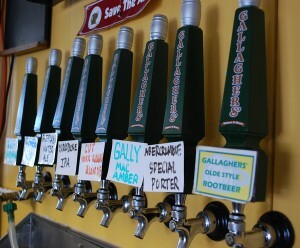 Have you ever visited Gallaghers’ Where U Brew? How was your experience? What recipe did you choose? We’d love to hear all about it! You can leave a comment below or connect with us on Facebook, Twitter and Google+. You can also like Gallaghers’ on Facebook. I’m sure they’d love the support! Don’t forget to also visit Seattle Bloggers for more great places to eat and drink in the Emerald City! I just heard about Gallagher’s today and it sounds kind of, almost perfect, for my husband and son. I am curious to know how many bottles you got from your batch and if you wouldn’t mind saying, how much did that process cost. The person I spoke to thought he paid about $200 for his experience. I am asking because I would purchase a gift card, and just want an idea. Thank you so much for posting and helping! Sorry for the delay, Diane. We honestly don’t remember how much we paid at the time. Looking at the Gallagher’s website, it’s $155-$185 for a full batch of beer and $100 for a half batch. What a cool experience for your husband and son! We hope this helps!! !